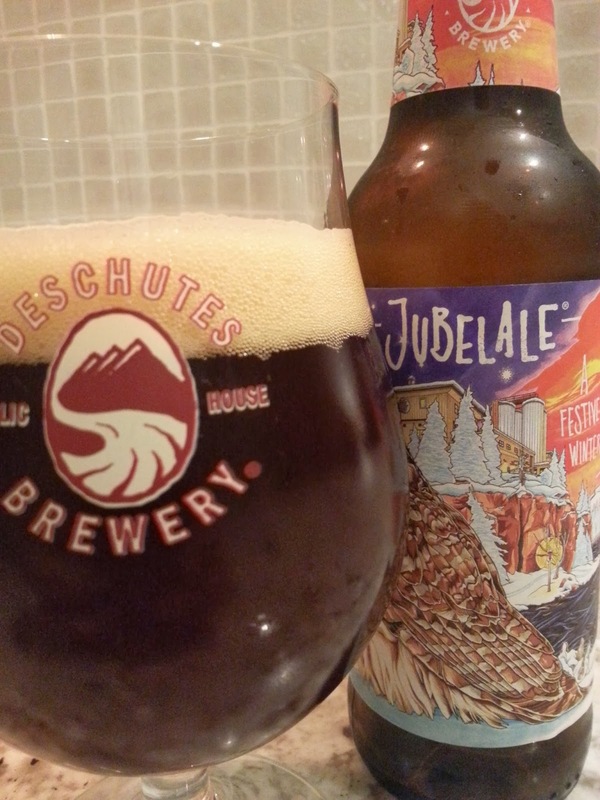 Another of my annual favourites, Deschutes Brewing has been producing Jubelale since 1988. For that first few years it was bottled by hand in 750ml bottles until becoming their first beer that was released in six-packs in 1993. Back then the label was a simple Christmas wreath added around the brewery's iconic oval label containing a mountain and stream. Starting in 1995, a different regional artist has been commissioned each year to create the artwork for the label. 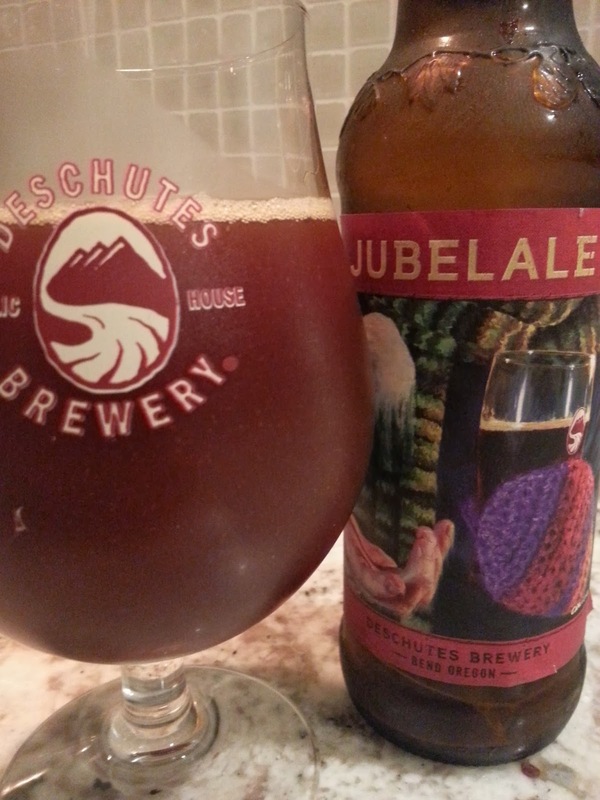 Poured into a large Deschutes snifter, it had a big fluffy tan head that settled slowly and left great lacing. 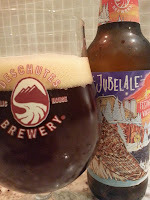 The mouthfeel on it is exceptional, it's so silky smooth that it feels like the beer is just floating over your tongue. I actually had to slow myself down or this beer would have disappeared in only a few drinks. Lots of sweet and toasted malts in the aroma and flavour. A little holiday spice with a touch of chocolate coming through before finishing with a slightly piney bitterness. At 6.7% ABV, it's actually on the lower end for a Strong Ale, but that's part of what makes it such a drinkable beer. This year's label is titled "Lost in the Loud" by local Bend, Oregon artist Avlis Leumas who's goal was to "create balance with opposites: as serene and quiet as the piece is, there is movement and activity everywhere”. 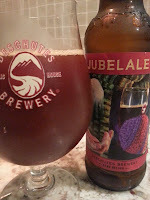 Whilst digging around in my cellar, I found a bottle or two of Jubelale from 2011 and its aged very well. The colour is a little lighter and the head is not as fluffy and dissipated quite quickly. There's a lot more toffee and roasted malts in the aroma and flavour then the one from 2013. The finish is less bitter (as would be expected since hop bitterness drops off quickly as a beer ages) and has been replaced with a stronger roasted coffee flavour. The mouthfeel is a little thinner, but still quite creamy and smooth. I'll definitely have to put a few away from this year to age. The label art for this release was a collaboration by artists Cara Thayer and Louie Van Patten which "explores a painted dialogue of human forms". It was further explained that "the hand-knitted mitten and scarf reflect the handcrafted character of Jubelale, while the snowball in motion evokes the fleeting nature of winter".